In a match that may sound unusual at first, there is a gaming company in South Korea that has been consistently contributing to the country’s cultural heritage preserving organization. The Korean arm of Riot Games has given over 5 billion won ($4.4 million) to the Cultural Heritage Administration here for the past seven years. The funds were spent on helping preserving palaces, heritage sites, and most recently for the recovery of a 102-year-old printing woodblock that had been lost for many years. 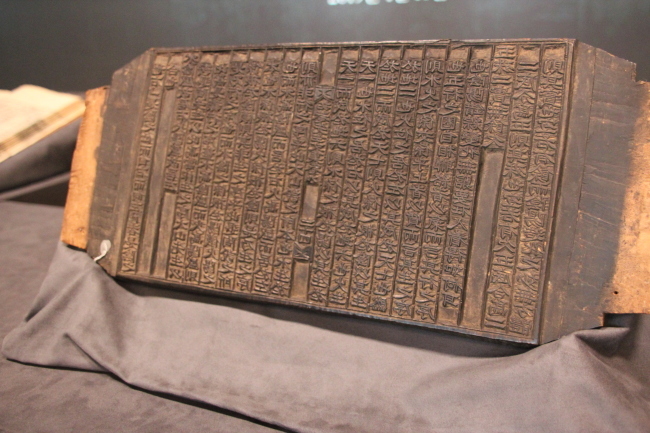 The woodblock, one of some 1,000 rudimentary printing tool for the 18 books written by end-Joseon era independence fighter “Cheokam” Kim Do-hwa (1825~1912), was found in the lot for a small auction that was to go up in Germany. The historic relic had been in the possession of an Austrian family, from whom the Overseas Korean Cultural Heritage Foundation, an organization under CHA, acquired it in March. The returned artifact was showcased to the press on Thursday at the Riot Games Korea’s office in Gangnam, Seoul. “The return of the artifact carries more meaning in the year of the 100th anniversary of establishment of provisional government in the time of Japanese occupation of Korea,” said CHA’s official, accrediting Riot Games as who made the achievement possible. This is the third cultural heritage returned to Korea thanks to the game company. In 2014, “Shakyamuni Triad,” was retrieved from the State Hermitage Museum in US, and in 2018, “Bamboo Investiture Book for the Crown Princess of Hyomyeong.” was recovered from an auction in France. The latter was a bamboo-inscribed declaration of a Joseon Dynasty crown princess (1637-1700), for which the starting bid was a mere 1.3 million won ($1,150). After the OKCHF identified the item to be more than a simple wedding scroll used during Joseon era as purported in the auction, the lot was reassessed, and was traded for 160,000 euros to the OKCHF. The fund had been amply provided for by Riot Games Korea. The cultural heritage rescue work is Riot Games’ steadfast corporate social responsibility act here. The company began official operation in Korea from end-2011 and quickly became an invested partner to the CHA. “We had promised the public to donate all of our proceeds from the first six months to an unspecified non-profit,” explained a Riot Games Korea official. During those times, the team was also launching localized in-game features for the “League of Legends” players in Korea, which involved massive research of ancient scrolls, history, legends and folklore. “We naturally amassed knowledge and interest in the traditional Korean cultural heritage, and realized we could link the game and the historic treasures,” the official said. Riot Games soon became CHA’s biggest donor, joining such companies as Starbucks Korea and LG Hausys that have also made financial contributions to the OKCHF operations. South Korea is the only country in which the game company headquartered in Los Angeles, US, to contribute to national cultural heritage projects. Riot Games’ first and only game “League of Legends” attracts approximately 100 million monthly active users, globally. The game can serve as a platform to inform the younger gamers of historical knowledge, the official offered. “When we introduce an in-game item, and later announce that the item is an existing relic that was returned to the country, the gamers send back positive, patriotic feedback,” Riot Games offical said. It also casts the games in a brighter light in the eyes of the older generation. 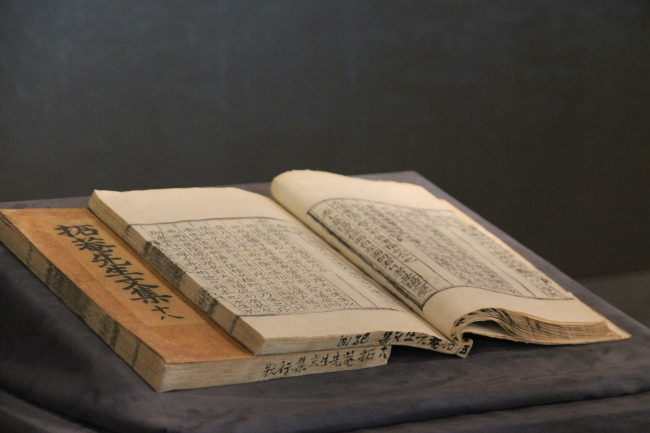 The newly recovered “Printing Woodblocks of the Collection of Kim Dohwa (Cheogam)’s Writings,” page 23 and 24 of the ninth book will be kept at the Korean Studies Institute in Andong, North Gyeongsang Province along with the other 20 found woodblocks. 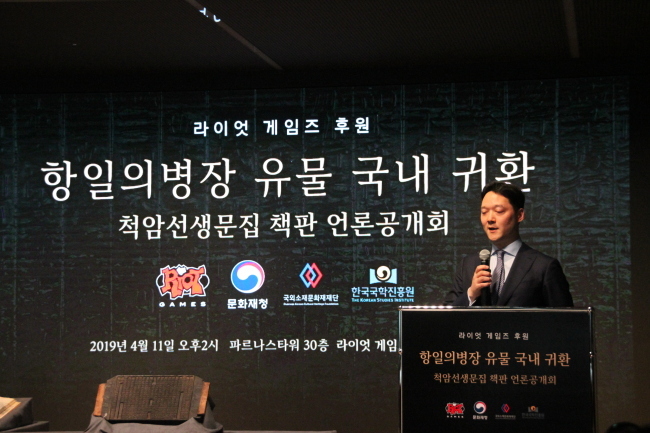 Riot Games will continue to give to the maintenance and salvage works of cultural heritage of Korea, the company said.